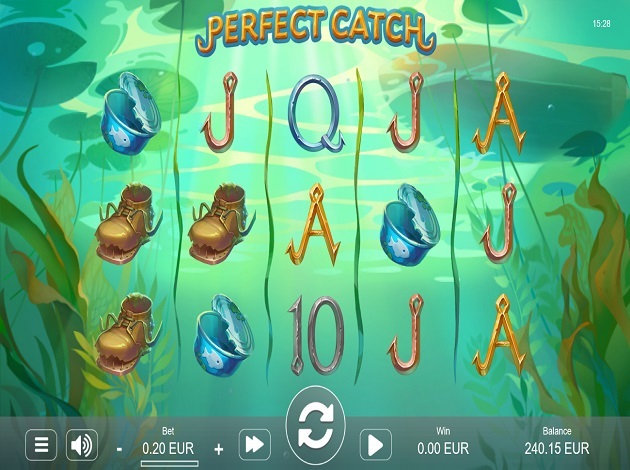 Get lost under the sea as you spin the reels to see if you can get the perfect catch in this slot from STHLMGAMING. Perfect Catch consists of five reels, three rows and 20 paylines along with special fish symbols that add extra features to your spins! Not only do these extra special symbols help you in this slot under the sea, but there is also the Perfect Catch free spins round where these fish will come out from hiding and appear much more frequently in the game. The special fish symbols will appear on reels two, three and four adding an extra feature to the spin and then transforming itself into a wild symbol for even more winnings! The red fish awards a win multiplier multiplying the win by 2-5x and then transforms itself into a wild. Several of these multipliers can appear and will add each other. The yellow fish awards an extra win of 1-25x your bet and then will transform itself into a wild symbol. The blue fish adds one or two extra wilds on the same reel and then transforms itself into a wild symbol. The wild symbol substitutes all symbols except for the free spins symbol. The free spins symbol appears anywhere on the last reel in the base game and will trigger the free spins game. Alongside these various special symbols there are a few others in Perfect Catch such as a crawfish, a green frog, an old shoe, a can of tuna fish as well as the traditional playing card symbols such as the Ace, King, Queen, Jack and 10. The free spins symbol will trigger the Perfect Catch free spins which will award you with either 8, 12, 20 or 30 free spins. What’s more is that the during the free spins round, the fishes spear more frequently on the reels giving you even better winning combinations! The unamused crawfish is the highest paying symbol in Perfect Catch can earn you up to 125x your total bet! Coming in second is the sleepy frog which can reward you with up to 25x your total bet for five of a kind. The old shoe and the can of tuna fish can reward you with up to 12.5x your total bet. The Ace can earn you up to 7.5x your total bet while the King and the Queen can reward you with up to 6.2x your total bet for five of a kind. The Jack and the 10 can award you with up to 5x your total bet which are the lowest paying symbols in Perfect Catch. The graphics, animations and sounds in Perfect Catch are impeccably made with a lot of focus on the even the smallest details! The reels are set underneath the water with seaweed and lilies popping up on the sides; if you look closely you can even see them slightly moving next to the reels. The colour scheme in Perfect Catch is based on the colours of the sea with a lot of green, turquoise and even some yellow. In the background is an extremely calming and soothing soundtrack however, you can still hear the water moving slightly, too. When you spin the reels or land winning combinations, other sounds will come into play adding even more dimension to the game. STHLMGAMING did a wonderful job in the creation of this under water themed slot as it is unique and appealing. If you want to use the autoplay option in the game, you can do so by pressing on the button to the right of the spin button. The paytable information can easily be found by clicking on the three horizontal lines button to the very left-hand corner of the play screen. Perfect Catch is an easy on the eyes game, with attractive and engaging graphics as well as a soundtrack that keeps you calm and at ease as you spin the reels. There are also plenty of opportunities to win some nice rewards with the special fish symbols and all their specific attributes as well as the free spins round which can offer up to 30 free spins giving you more than enough chances to be nicely awarded! You can check out Sunset and Boost It at Videoslots.com now!